The Gretsch Style 1 G9511 Single-0 Parlour Acoustic Guitar in Appalachia Cloudburst is a glorious addition to their Roots Collection of acoustic guitars. Resurrecting a level of design, detail, and craftsmanship from a bygone era, from a time when travellers would wander across the USA with little more than the clothes on their back, and a guitar in their hands, the G9511 is perfect for blues, bluegrass, country, and folk fans who want to recapture the authenticity of that time. 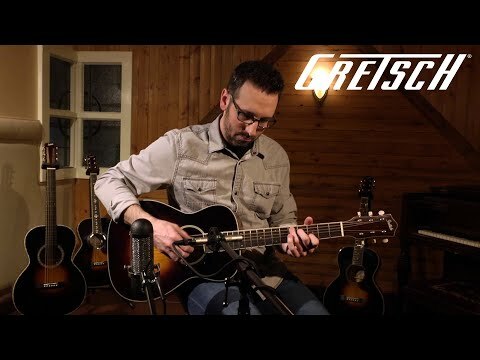 As we've come to expect from Gretsch, the G9511 single-0 is lovingly crafted using high quality tonewoods to produce a rich timbre. Shaped to the diminutive parlour body shape, the guitar may be small, but it boasts a sophisticated character with an impressive dynamic range. The body back and sides are built using laminated mahogany, which establishes a confident mid-range tonal foundation. The use of laminate wood also gives the body greater resilience in handling changes in humidity and temperature, making it great for travelling with. The top is built from solid spruce, a fantastic choice for use as the soundboard due to its willingness to resonate enthusiastically. Reinforced using quartersawn X-bracing, the top can move freely to produce a powerful output, without capitulating to unwanted buckling or warping. Fitted to the body is a 24.875-inch scale length mahogany neck, which provides a generous playing support that is as solid as they come. Treated to a satin finish, your fret hand is given the freedom to roam without stickiness or tackiness from impeding your movement. Shaped to the slim "C" profile, the neck sits comfortably in the hand. Paired with the neck is a 19-fret rosewood fingerboard, which is adorned with mother-of-pearl diamond inlays to guide you. Starting at the headstock, you'll find vintage-style open-back tuning machines, which work dutifully alongside the bone nut to ensure uniform string tension and tuning integrity. The body is home to a rosewood bridge, which anchors each string securely to optimise intonation and sustain. Aged white neck binding traces from the headstock to the body, complementing the exquisite Appalachia Cloudburst finish perfectly. The Gretsch Style 1 G9511 Single-0 Parlour Acoustic Guitar in Appalachia Cloudburst is perfect across a wide range of musical styles, and is suited to both fingerstyle and flatpicking. Whether you’re performing solo or as part of an ensemble, the vibrant timbre of this beauty is astounding for its size.